Wineries and vineyards often host more formal events that tend to want a higher quality of production than simply having people get together. 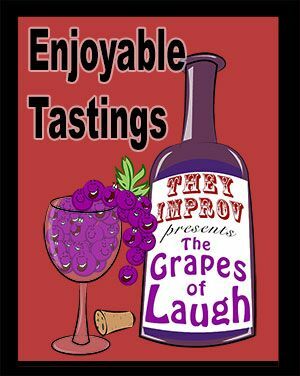 Including the Grapes of Laugh can help to make your wine tastings more enjoyable. For such corporate events and private parties, The Grapes of Laugh can provide your group with an Emcee to help host your event as well as characters to help create ambiance. EMCEE: Our Master of Ceremonies can host your event, introducing elements as they come up, as well as to provide additional comedic elements to the gathering. We consult with you to get the level of service that you require while coordinating with your budget to keep the cost within your range. There's an advantage to using a company such as our own for these events. After all, if one Emcee were to fall ill, we can replace them. Likewise, we have a staff of writers and coordinators that can help prepare the event ahead of time. Simply call us to find out how we can make this happen for you. WELCOMING AND SEND OFF: We can provide a variety of ambiance characters to welcome your guests to the venue making them feel like stars! We can serve as papparazi, reporters, fans, butlers, or any other such approach. Likewise, if your party is meant to be in the 1920's or other era, our staff can be in place and dressed appropriately. Simply contact us for such options to come up with a plan for your event. MAKING SCENES: We can keep the evening rolling by having our actors perform scenes and give your guests things to talk about. This can take on the form of personal drama, could be more of a presentation, or could be to get across elements of your corporate doctrine. This might take more consulting and we look forward to discussing this wit you.